Note: Labor for Palestine and the US Palestinian Community Network are co-endorsers of this statement. To sign on, email info@al-awdany.org. From the ruins of Oslo have emerged new campaigns with holistic goals. The most significant of these has been the Boycott, Divestment, and Sanction (BDS) movement, initiated and overwhelmingly supported by Palestinian civil society. If your organization would like to endorse or co-sign this statement, please email us at info@al-awdany.org. The working class movement in Turkey is starting to join the Boycott Against Israel Campaign. While the working class movements around the world has escalated the campaign against Israel by refusing to unload Israeli cargo ships, the Dock Workers Union “Liman-Is” is the latest union in Turkey joining the anti apartheid, anti racist campaign against the state of Israel. The recent campaign against Israel started by the left and progressive organizations is beginning to get support from the workers’ unions as well. The movement against Israeli apartheid was successful in bringing the entire spectrum of the left against Israel’s racist and imperialist regime. However now, the movement is starting to gain support within the working class organizations as well. The Boycott Against Israel movement aims to cut all ties, military, economic, diplomacy, academic and cultural, with the state of Israel. Following the Physicians’ Association of Turkey which had endorsed the campaign from the very beginning, the dock workers’ union Liman-Is is now also calling for a comprehensive boycott against the reactionary state of Israel. The movement had organized a successful symposium for Palestinian rights and against Israel where the representatives from the world had gathered to discuss the the strategy of such a boycott. During the discussions, the Chamber of Agricultural Engineers of Turkey, a participant in the symposium announced it was joining the boycott against Israel. “Humanity is once again confronted with the bloody face of Israel when it attacked, murdered, and wounded many innocent civilians who were on their way to deliver humanitarian aid to Gaza. “This attack by Israel, which had for years displayed the most brutal and barbaric terror in Palestine, is now aimed towards the third party civilians. This must be taken as an assault against all of humanity. “The attack that was protested throughout the world and condemned harshly by the UN also brought people out to the streets in Turkey. The government’s announcements indicate that further sanctions against Israel is to be expected. However, Israel needs to be replied not only through the channels of the government, but through all institutions and organizations that direct societies, most of all, through NGO’s and unions. “Our union Liman-Is, has decided to boycott the ships from Israel which has become a machine of death and torture. In the framework, no member of our union will give service to Israel in any docs that we are organized at. “Liman-Is union invites all unions and NGO’s organized in our country and throughout the world to join this boycott and protest campaign. Press release from The Swedish Dockworkers Union, section 4, Gothenburg. – Tens of containers were put under blockade tonight. 2. Allowing an independent, international investigation of what happened at the Israeli boarding of the so called Freedom Flottilla when nine people were shot to death. In the harbor of Gothenburg the blockade were initiated without any complications. About ten containers, both Israeli imports and exports were immediately identified in the container terminal. All of which have been separated and will stand untouched in the harbor of Gothenburg until the end of the blockade at 24:00 the 29th of June. – Everything has passed very calmly and I believe it will continue to do so until next Wednesday, says Peter Annerback, chairperson of the Swedish Dockworkers Union section 4 (Hamn4an) and member of the unions executive committee in a late comment. – Since we are not in a conflict with our employers a “conflict-contained” container that carries any medical equipment will be allowed exemption, continues Annerback. – We have identified more goods on its way to or from Israel than we had expected. We thought the flow of goods would be much lower considering the blockade has been announced for twenty days, says Hamn4ans trustee Erik Helgeson. – Our ambition is of course that our action can be one of many grassroots initiatives that will keep the eyes of the world focused on the 800.000 children that lives isolated in Gaza. The Palestinian civilian population must be allowed to rebuild their economy, their infrastructure and freely integrate with the rest of the world. The war on Gaza and Israel’s brutal blockade have made all this impossible for over three years now, Helgeson ends. Furthermore, by Executive Action we call on the ILWU International officers to lend their voice in protest with other unions against this atrocity by issuing a policy statement in line with the ILWU’s past position on the question of Israeli repression of Palestinians and call for unions to protest by any action they choose to take. Labor for Palestine salutes ILWU Local 10 and its members for refusing to unload the Israeli ship that arrived in Oakland on June 20 (see reports below*). Their action is in direct response to Israel’s May 31 brutal assault on the Gaza Freedom Flotilla. Taking place in international waters under cover of darkness, the Israeli attack targeted 750 unarmed volunteers from 40 countries seeking to relieve the humanitarian crisis caused by Israel’s siege of collective punishment against the 1.5 million Palestinians in Gaza. Because of Israel’s attack on the Flotilla, scores were killed and wounded, while hundreds of survivors were abducted, jailed and deported. This act of piracy is a direct extension of the 2008/2009 Gaza massacre that killed 1400 people, most of them civilians, which has been condemned by the UN, Amnesty International, Human Rights Watch and other human rights organizations, including those that are Israeli. Workers in the United States have particularly good reasons to act. In the past ten years alone, the US government — with overwhelming bipartisan support — has given Israel $17 billion in military aid; over the next decade, it will give another $30 billion. Top US labor officials — often without the knowledge or consent of union members — collaborate with the Histadrut, the segregated Zionist labor federation, and its mouthpiece, the Jewish Labor Committee, that defend every attack on Palestinian rights, including the Flotilla Massacre. These same leaders invest billions from our union pension and retirement funds in State of Israel Bonds. Noting that “Gaza today has become the test of our universal morality and our common humanity,” the Palestinian trade union movement has specifically called on dockworkers around the world to refuse to handle Israeli cargo. Local 10 now joins with dockworkers in South Africa, western Australia, Sweden and Norway, who have answered this call. This action stands in the proud tradition of West Coast dock-workers who refused to handle cargo for Nazi Germany (1934) and fascist Italy (1935); those in Denmark and Sweden (1963), the San Francisco Bay Area (1984) and Liverpool (1988), who refused shipping for apartheid South Africa; those in Oakland who refused to load bombs for the Pinochet dictatorship in Chile (1978); and those at all twenty-nine West Coast ports who held a May Day strike against the wars in Iraq and Afghanistan (2008). Israel deliberately carried out the Gaza Freedom Flotilla Massacre in order to silence opposition to its strangulation of Gaza. But just as the 1960 Sharpeville Massacre and the 1976 Soweto Massacre spelled the ultimate doom of South African apartheid, Israel’s attack has already had the opposite effect. New waves of volunteers are coming forward to break the siege, which is already beginning to crack. The movement for Boycott, Divestment and Sanctions (BDS) against Israel is spreading. Already, it is clear that the Flotilla martyrs did not die in vain. And just as labor solidarity played a critical role in toppling South African apartheid, it now has the potential to cripple Israeli apartheid. We urge the entire ILWU and all trade unionists to stand behind and expand on this critical issue of conscience and solidarity, and invite supporters to endorse “Labor for Palestine Condemns Gaza Freedom Flotilla Massacre, Supports Worker Action to Boycott Israel”: http://www.laborforpalestine.net/wp/2010/06/07/gaza-flotilla-massacre/. Union dock workers refused this morning to cross picket lines to unload an Israeli ship, in support of Palestinians everywhere. If the evening shift does the same, the ship will not be unloaded!!! 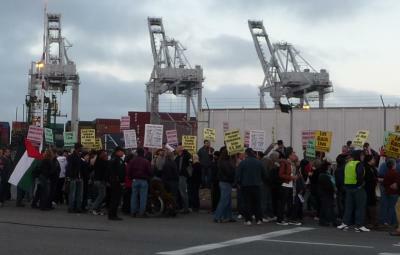 ILWU members refused to cross picketline – citing “health & safety” provisions of their contract. Management demanded “instant arbitration.” The arbitrator took a look at the picketlines at each gate to the SSA Terminal and ruled that ILWU members were justified in refusing to cross. All dockworkers were sent home with FULL PAY. The blockade represents the first time in U.S. history that a protest has stopped an Israeli ship from unloading. The union workers of the ILWU explain their decision to not unload Israeli goods in the Oakland port, citing past decisions to unload the goods of other countries that violate human rights on a massive scale with U.S tax dollars and heeding the call of Palestinian civil society which has called on the world to apply boycott divestment and sanctions akin to the actions that brought down apartheid south Africa until Israel ends it’s brutal military occupation of the Palestinian people, ends the siege on gaza, and grants equal rights and respects the human rights of all people living under Israeli jurisdiction. Israeli Ship Blockaded at Port of Oakland! OAKLAND, Calif. (KCBS) — Hundreds of protesters gathered before dawn at the Port of Oakland to prevent dock workers from unloading a cargo ship from Israel on Sunday. Hundreds of demonstrators, gathering at the Port of Oakland before dawn, prevented the unloading of an Israeli cargo ship. The demonstrators, demanding an end to Israel’s blockade of the Gaza Strip, picketed at Berth 58. Your action today is a milestone in international solidarity from honest and brave U.S. workers and trade unionists. For veteran Bay Area activists, today’s victory echoed a historic milestone in 1984, when ILWU workers in San Francisco refused to unload a ship called the Nedlloyd Kimberley, because its cargo came from South Africa. Just 10 years later, Nelson Mandela was elected president, and apartheid – in its South African form – was dead. Its 2010 congress last week voted overwhelmingly to “sever all relations with [the Israeli trade union federation] Histadrut, and to urge other trade unions and bodies to do likewise”. In the wake of the murderous Israeli commando attack on an unarmed aid flotilla to Gaza on May 31, more trade unions in Australia are joining the Boycott, Divestment and Sanctions campaign against Israel. Here Andrew Ferguson, the NSW Secretary of the Construction, Forestry, Mining & Energy Union (CFMEU) addresses the Sydney June 5, 2010 Gaza solidarity rally. He is introduced by Pip Hinman of the Stop The War Coalition. In a historic labor community protest on June 20, 2010, more than eight hundred people joined picket lines in the Port of Oakland SSA terminals to call on ILWU Local 10 and ILWU Local 34 members not to cross the picket lines and work the Israeli Zim ship Shenzhen. The protest was organized against the attack by Israel on the aid flotilla going to Gaza and the ongoing Israeli blockade of Gaza. The union longshore workers refused to cross the picket line and the protesters as a result were successful in stopping the work on the SSA terminal for 24 hours halting the ships departure until the following day. This was the first direct labor action by workers in the United States in solidarity with Palestinian workers and people. It also shows the link and continuity of this action with the 1984 apartheid picket of a ship from South Africa. Zim Line was actively engaged in supporting the apartheid regime in South Africa. ILWU workers and others make comparison of these pickets and also why they consider Israel an apartheid regime. The port boycott picket was also endorsed by the Oakland Education Association OEA and the San Francisco and Alameda Central Labor Councils. Many bay area trade unionists who joined the picket line speak out on this issue and why they have taken a stand.